I've never celebrated Lent before, growing up in a Christian tradition that didn't think much of many traditions. But this year, when my iPhone YouVersion Bible app prompted me to sign up for one of their many free plans, I decided to start reading N.T. 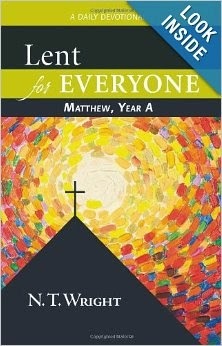 Wright's Lent for Everyone (Year A), a devotional that takes readers through Matthew's gospel and includes reflections from the renowned scholar. At the very heart of Jesus' vision of the kingdom — of heaven's kingdom coming on earth — we have a picture of one person, secretly in their own room, praying. Prayer is a mystery. I've often heard people saying, with a sneer, 'It doesn't go beyond the ceiling, you know.' But the point of prayer, at least the way Jesus saw it, is that it doesn't have to. Your father, he says, is there in the secret place with you. He sees and knows your deepest thoughts and hopes and fears. He hears the words you say. He hears, too, the things you can't put into words but want to lay before him anyway. Prayer, in fact, isn't a mystery in the sense of 'a puzzle we can't understand'. Prayer is a symptom, a sign, of the mystery: the fact that heaven and earth actually mingle together. There are times when they interlock; there are places where they overlap. To pray, in this sense, is to claim a time and place — it can be anywhere, any time — as one of those times, one of those places. I love that image of prayer being the connection between earth and heaven. It encouraged me to be bold and pray throughout the day whenever a need came my way. Review of "Clutterfree with Kids"
Review of "Slow Family Living"